Most people think that the zebra’s black and white strips would be poor camouflage because these animals are often shown running across open country. However, among the thorny shrubs of the African bush the stripes make zebras hard to see. The zebras apparently also use their stripes for identification because the pattern changes from animal to animal. As with the zebra, no two of Cabot’s Zebra Damascus 1911s are identical. All the hand-made components reflect their individual origins and provide a dramatically different appearance for powerful precision handguns built to competition standards. When making a Damascus billet, each technique and choice of raw materials gives a distinctive result. Usually craftsmen are satisfied to alternate two types of steel to make their Damascus. These layers are folded, reheated and reforged many times to make a product containing the hundreds of layers found in a typical Damascus blade. The danger in making Damascus is that heat alters the chemical and physical attributes of the product which can yield a disastrous result. The masters of making stainless Damascus steels must balance all of these factors to produce a product strong enough to make firearms. 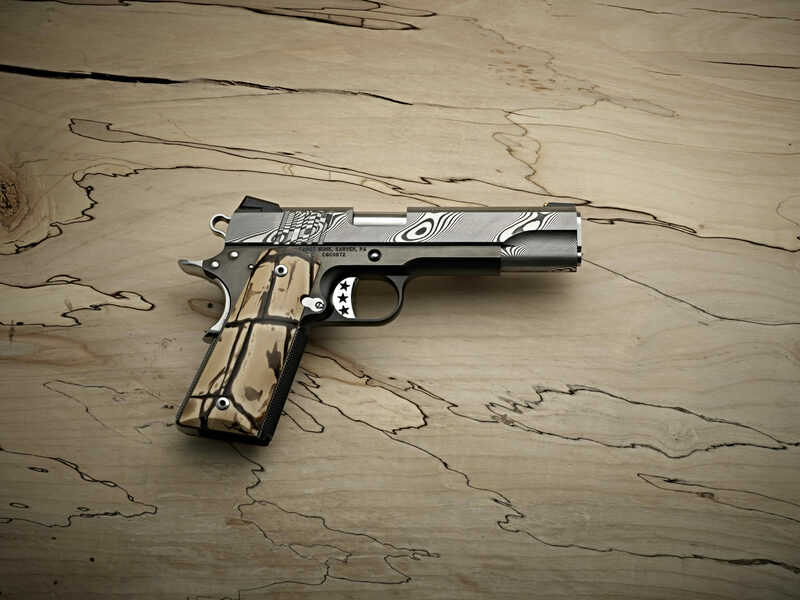 An added layer of difficulty was taken on with the Zebra Damascus 1911. Two types of extremely fine quality stainless Damascus are used to produce striking materials forged into a piece of steel over an inch thick used to make the gun’s slide. The result is striking because sections of very fine cross-hatched Damascus are alternated with a much wider pattern to make a slide with contrasting layers presented at an inclined angle. The beauty of the steels is brought out by a specialized etching techniques developed for this material. At Cabot, this high-purity stainless Damascus is crafted to extremely close tolerances, using machining and electric discharge machines (EDM technology) that can cut parts to extremely close tolerances. When combined with hand-fitting and finishing techniques, what were once blocks of steel become unique, effective self-defense or competition handguns. Also added at Cabot are grips made of mammoth ivory dredged from the North Sea and stabilized with space-age resins to continue the contrasting color theme of the pistol’s steel components. During the last Ice Age there was land between the European continent and the British Isles as the sea level stood 200 feet lower than today. This land was inhabited by the mammoths that carried sweeping ivory tusks up to six-feet long that are recovered by fishermen’s trawling nets and sold at channel ports. 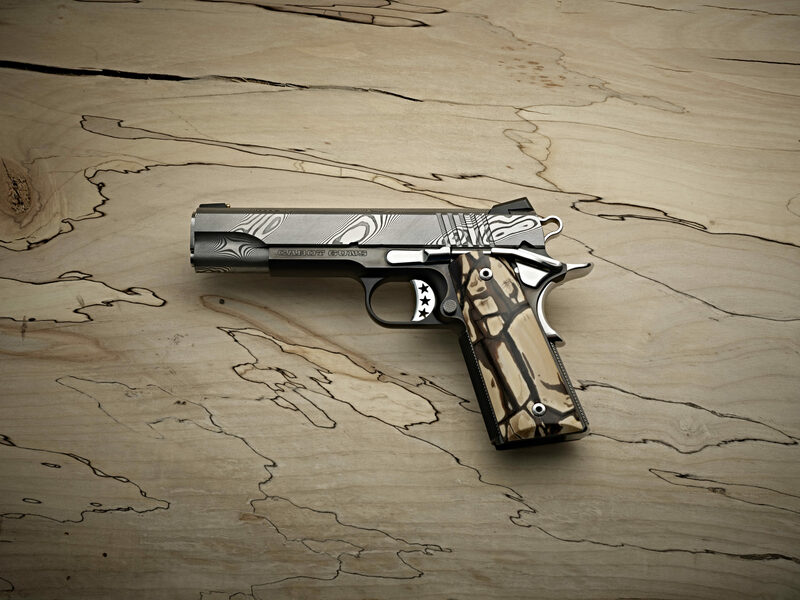 Making the Zebra Damascus 1911 is the combined work of specialists working in different arts, sciences and crafts to produce working examples of Colt 1911 .45 Autos that are like no others. The Cabot Guns 1911 Zebra combines unparalleled design with proven match-wining functionality to make one of the world’s most dramatic functional firearms.